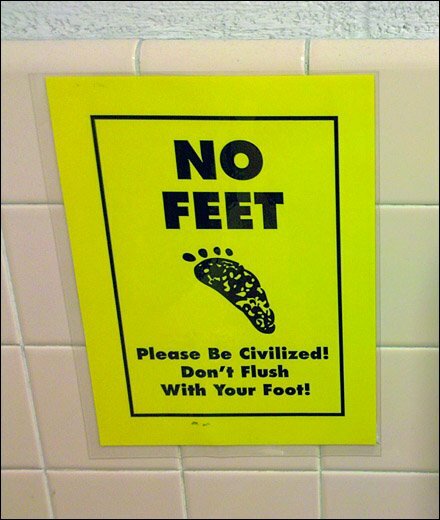 Though mildly Obsessive-Compulsive I am not so afflicted as to even conceptualize the need for Don’t Flush With Your Feet warning as a way to avoid germs and the touch of others in a restroom. But apparently, OCPD runs rampant in some locales and requires restroom signs to curb the disorder. 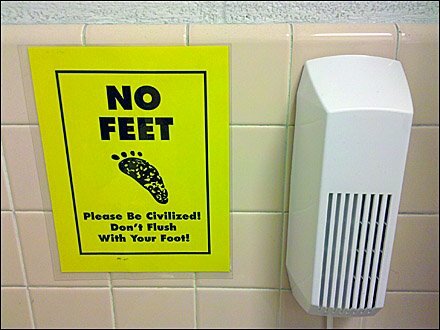 In that FixturesCloseUp documents Amenities and Anti-amenities in retail, my personal OCPD did force me to record this sign and post for your enjoyment … or as an idea of how not to touch fixtures others already have. Why Buy Frozen Fish Food For Your Fish?